Accumulation of fat in the neck gives the appearance of older age and obesity. People today want chiseled looks with sharp jawline and chiseled necks. 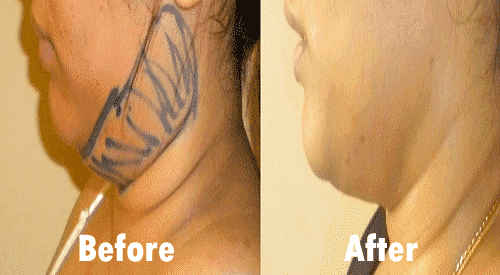 Double chin correction can be done with Non surgical as well as surgical correction. Double chin and heavy necks are very common. These can occur in young adults also. The procedure for correction day care. Liposuction is the best procedure to get the best results. We use VASER or Smart Laser Lipo. Vaser is used to liquify the fat and tighten the skin. Liposuction is then performed to take the fat out. Neck strap is used for 3 weeks to allow skin contraction and reduce swelling. Mesotherapy with PTC, dissolves fat over 2 to 3 sessions. PDO threads cause skin tightening, and is useful in patients with loose skin and minimal fat in neck. Liposuction with either Laser lipo or VASER is the most important and safest everlasting way to correct double chin. A short procedure , under local anesthesia takes care of all the extra fat as well as causes skin tightening.